"He was both admired and hated, often by the same person"
Reza Khan was born around 1877 in a small village in Mazandaran. His family had served in the Qajar army, but he was an orphan by the age of 6. He grew up poor, and uneducated. Little more is known until he appears as a member of the Russian-officered Cossack Brigade, where his character - he was intelligent, able, and determined (and he learned a lot from the Russians - and after 1917 from the British) - led to rapid promotion. He was also tall, dark, and charismatic - which helped. He'd risen to colonel of the regiment by 1918: after the coup he soared to general, Minister of War and Commander-in-Chief. British involvement in his rise was always denied (by both sides) - but Field Marshall Ironside's diary shows he'd been handpicked to carry out their "Plan B". Reza Shah, whatever the truth, did nothing to repay his benefactors - rather showing himself as pro-Russian ( a friendship treaty was signed in Moscow on February 26th - in the first week of the coup). Prime Minister Sayyid Zia, having promoted Reza Khan to Commander-in-Chief of Iranian forces, issued a blueprint for change: an end to the power and influence of the wealthy landowners, an end to corruption, promotion of economic self-sufficiency, social justice, more education - and a termination of the 1919 Anglo-Iranian agreement (effectively dead anyway). But his policies made enemies, and Reza Khan realised that cooperation with the Qajars might do him more good than tying himself to a populist demagogue. He sacked Sayyid Zia, was appointed regent for Ahmad Shah, who made him Prime Minister - and, as the shah left for Europe, never to return - de facto ruler of Iran. As Commander-in Chief, Reza Khan led a series of successful military expeditions to crush rebellious movements in various regions. His most celebrated action, however was the easiest. Shaikh Kaz'al in Khuzistan thought he was safe in his independent corner of the south-west, thanks to his great friends, the British. The British did nothing to help him, and Reza Khan had a simple victory - which allowed him to return home to Tehran in triumph. Compulsory national service (unpopular with landowners as their workers would be taken away for two years; the ulama feared foreign un-Islamic practices). Taxation, including income tax, to pay for a railway. Weights and measures standardised. Pre-Islamic calendar revived. Birth-certificates introduced - and everyone was to have a surname, European-style. He chose Pahlavi - the language of the Parthians. Old titles of the nobility were abolished. "This bullet-headed man, with the voice of an asthmatic child, now controls the destinies of Iran ... What has she gained? There is no liberty in Persia today - there is fear, corruption, dishonesty and disease." Reza was respectful of the Bakhtiyari tribe (based west of Isfahan in the southern Zagros mountains): they'd played a prominent part in the 1906 revolution, and were a potentially powerful destabilising force. He humoured their leader, Sardar As'ad - pretending to favour him, and actually appointing him Minister of War, while all the while intending to destroy him and his tribe. Gradually he began undermining them: a punitive indemnity was imposed on a specious charge; Bakhtiyari khans were forbidden armed retainers; the Anglo-Iranian Oil company was stopped from leasing Bakhtiyari land. These actions, together with day-to-day high-handedness and persecution, provoked a rebellion in 1929 - an excuse for Reza to move in closer. Khans were imprisoned and executed - with Sardar As'ad himself dying in suspicious circumstances. By 1936, when their lands were split between Khuzistan and Isfahan, the Bakhtiyari effectively no longer officially existed. "...the means by which it was achieved were barbarous, ruthless and short-sighted ... undermining of their health ... refuse rotted in the villages, polluting springs ... heavy toll of life ... Reza Shah's instructions were often exceeded by his depraved officials, whose aim ... was to exploit the situation for their own gain and sadistic satisfaction." No socialism was involved: if Reza Shah wanted to modernise Iran, only the shah himself could do it. His rule was increasingly brutal and tyrannical - but he still won popularity as a symbol of a modernising and proudly independent Iran. Roads - there were no metalled roads. Reza Shah invited foreign contractors to help, and soon a road network was established - and lorries replaced camels. Railways - again there were none. Reza Shah, with foreign assistance, built lines between Tehran and the Gulf - later extended to Tabriz, Mashhad and the Caspian, thus greatly reinforcing Iran's economy. State monopolies - existed for tobacco, cement and power. The private sector was also flourishing - but its aims were short-term personal profit and brought little permanent advantage to the country. Law - Reza Shah set up a legal system based on European practice to replace Shari'a courts; this included a Ministry of Justice, and a law faculty at Tehran University - with European lecturers. These developments did not prevent Reza Shah from imprisoning, exiling, or executing anyone he regarded as an opponent, or even a critic. Education - a European-style system was established, and although it catered mainly to the wealthy and professional classes, there was a growing pool of educated Iranians. The University of Tehran was founded in 1935 - although those who could afford it still preferred to go abroad. Urbanisation - the movement of population to the cities began under Reza: Tehran grew to a mega-city of over 17 million by the end of the century. Middle classes - saw their wealth grow immensely under the shah: that is army officers, bureaucrats, entrepreneurs. Attitude to history, tradition and religion. Reza Shah was keen to stress the continuity of history, reviving interest in the pre-Islamic heritage, and distancing Iran from the Arabs, while presiding over westernisation: encouraging European dress, the unveiling and education of women, surnames, enfranchisement of women and religious minorities (Armenians, Jews, Zoroastrians - though not ethnic minorities). All were to be equal subjects of the all-powerful shah. The rebirth of the nation was symbolised by the name change from Persia (based on European usage) to Iran (the name its people had always used). The ulama lost much power and influence - but were not attacked as in Turkey. 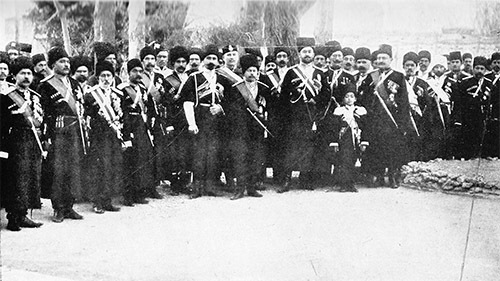 Several Ayatollahs openly opposed Reza Shah's programme - especially the legal, educational and social reforms. The Arabic script, though, was kept for Farsi - unlike Ataturk's reform which moved Turkish to a Roman script. Reza Shah, wanting to remodel Iran as a modern European-style nation-state, in order to win respect as such, would have preferred to ignore both Britain and Russia. But pragmatism was forced on him. Iran' s northern frontier was still vulnerable to Russia, and Britain controlled the oil fields of Khuzistan - his major source of income. He tried to break the Anglo-Persian Oil Company's hold - but in the event could only modify it slightly: the 1901 Knox D'Arcy concession was cancelled, and a new 60-year agreement in 1933 gave Iran a slightly bigger share of the profits (up from 16% to 20%; the lion's share still went to the British government and British share-holders). He hoped to replace British exploitation with support from the United States - who were unwilling however to antagonise Britain. Germany looked a much better prospect - since 1926 Germany had been involved in developing communications to and within Iran: roads, railways, and flights, and was by 1939 Iran's major trading partner. When Hitler invaded the Soviet Union, Reza Shah remained stubbornly neutral - refusing the Russians permission to use the railway to the Gulf, and perhaps anticipating German success in the Caucasus. Both Russia and Britain were seriously alarmed, and in July and August 1941, the allied powers demanded action against a feared German take-over. When Reza Shah insisted on his neutrality, Britain and Russia invaded, and occupied Iran for the rest of the war. On September 16, he felt forced to abdicate in favour of his son - and was taken away by the British. He died in South Africa in 1944. Summary: a reign of two halves. The beginning of his reign showed dynamic changes essential to bringing Iran belatedly into the modern world. But he changed into a ruthless dictator, who eliminated anyone who challenged his opinions. A small elite acquired education (including some women) and wealth, but the vast majority of the population was no better off than at the start of his rule. His emergence is curiously reminiscent of the career of Darius - acquiring power in a coup, with an obscure background; innovating, yet keen to exploit history, ruthless towards rivals and rebels. A builder of roads! This treaty lasted unit 1979. Russia renounced all claims to Iranian territory, An unique clause allowed Russia to intervene if Iran was a threatened by a "third party" - ie Britain! The veil was officially banned in 1936. But although women in the wealthier classes were considerably freer and had access to education, women generally were still treated much as always by a traditionally patriarchal society. They were accepted in the University of Tehran on equal terms.